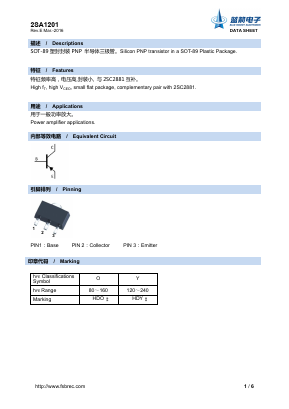 2SA1201 Datasheet PDF - Foshan Blue Rocket Electronics Co.,Ltd. High fT, high VCEO, small flat package, complementary pair with 2SC2881. 2SA1797 SOT-89 Plastic-Encapsulate PNP Transistors View Willas Electronic Corp.
2SA1201 SOT-89 Plastic-Encapsulate PNP Transistors View Willas Electronic Corp.